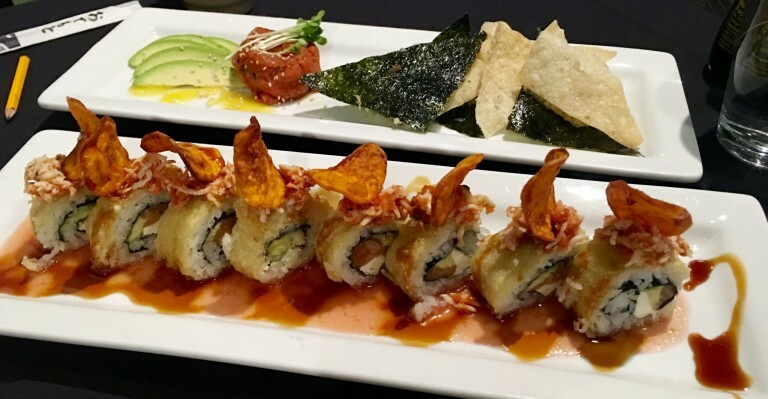 Top-rated Japanese restaurant and sushi bar Suehiro of Old Town Fort Collins recently underwent a makeover. Suehiro is now Wabi Sabi, a modernized Japanese place with the same owners, and a focus on shared plates with its redesigned menu. As a fan of the original sushi destination, I accidentally stumbled upon the reopened Wabi Sabi the weekend before school began. Hearing that it was still under the same ownership, I was more than willing to give it a try. Aside from the noticeable improvements, ranging from a wall mural and screens displaying the work of the sushi chefs, another factor that captured my attention was the pricing on the newly-released menu. While Suehiro had a slightly more student friendly menu with items such a Nigiri combination, Wabi Sabi’s focus on elegant shared plates seems to have caused a jump in pricing. We ordered the Tuna Tartar to start with, followed by the Vegas Lights roll. While both were indeed delicious, the portion size for the tapas-style Tuna Tartar did not quite feel worth the $12 price tag. It was well-seasoned and accompanied by a few wonton and seaweed chips, but was not large enough to be shared between more than two people. A complimentary miso soup and cucumber salad accompanied the meal, but it did little to curb my appetite. Tuna Tartar and Vegas Lights roll at Wabi Sabi Restaurant. Photo by Rachael Worthington. The Vegas Lights roll was very unique, delicious and creative. It was filled with smoked salmon, cream cheese, tempura avocado, spicy crab and topped with an apple coulis, soy glaze and spicy tuna. It was even adorned with sweet potato chips for presentation. It had a sweet and spicy tang with layers of flavor ranging from smoky to umami. For two people, these dishes were not enough for a full dinner, so we added the cleverly named Eating Nemo roll to our order. This was also quite good, but the description failed to mention the abundance of lemon; thin slices of preserved lemon also topped the salmon on the roll that was filled with crab, avocado and cucumber. It was drizzled with a wasabi aioli, which added to the zesty zing of the lemon flavor. I enjoyed it, but it was more of a personal preference; I could see it as a less popular choice because it doubled up on bitterness with lemon and wasabi. Wabi Sabi is a tasty destination, but in terms of Nigiri options, pricing, and portion sizes, I would have to say I preferred Suehiro. The other Suehiro destination is in the Front Range Village shopping center on Council Tree Avenue.